I’m almost never political in my posts about Burning Man, because Burning Man is not an inherently political event. It is welcoming to people whose thoughts range across the political spectrum, and rarely the center of political activism (albeit, some highly political works of art appear on occasion). But something has increasingly disturbed me about U.S. politics, and I want my Burning Man community to help change this growing trend. Not voting seems to be the “cool” way to deal with a frequently dysfunctional political system. In last year’s Congressional elections, only 37 percent of Americans voted. This is a shameful result — especially when viewed against the voting numbers for countries that do not have the same level of free speech and unencumbered politics as we enjoy in the United States. One aspect of the problematic trend toward non-voting is that it infuses young people more than older Americans. Younger voters have literally ceded control of the voting process to older citizens. The affect is a disproportionate representation of baby boomers and even older Americans in the voting booth, and the near absence of the voices of younger voters. It really doesn’t matter how younger people would vote, it only matters that they have elected not to be heard. When you combine overall low voter turnout with the much higher percentage of senior aged voters, then add in the effect of big money in the political process (an effect enabled and support by a Supreme Court that can’t seem to tell the difference between free speech and paid speech), you end up with a corrupted political system that looks to young people as if it’s rigged. Why vote if control of the country is out of your hands? And why vote when apportionment rules around the country have created a plethora of “safe” districts for one party or the other — districts that can never be captured by opposition candidates? The answer is that only by voting can citizens change the direction of the country, reject political blather vs. real content, and end the era when money, rather than patriotism, drives decision-making by our politicians. I, too, have found myself turning off most political speech these days. I’ve grown tired of politicians and government officials who never really answer questions but speak only from set talking points provided by their parties. But I continue to vote in every single election. So I guess I haven’t given up yet on the country and its politics. Playa fun. Can we transfer it to real life? As Burners, we believe in the principles of inclusion, the freedom to speak truth, and the unimportance of politics in maintaining friendships. So why are so many of us (assuming Burners are average in terms of voting numbers) rejecting the idea of participating in the electoral process. It makes no sense to believe in the wonder that occurs annually in the Black Rock Desert and then not try to bring that wonder into the rest of the world in every way possible. Voting your beliefs is one way to extend the culture of Burning Man into our everyday world. Not voting is NOT a statement of your beliefs. It is a declaration of invisibility. It is ceding the world to non-Burners. It is giving up and giving in. That’s just not the way people act when I see them at Black Rock City. 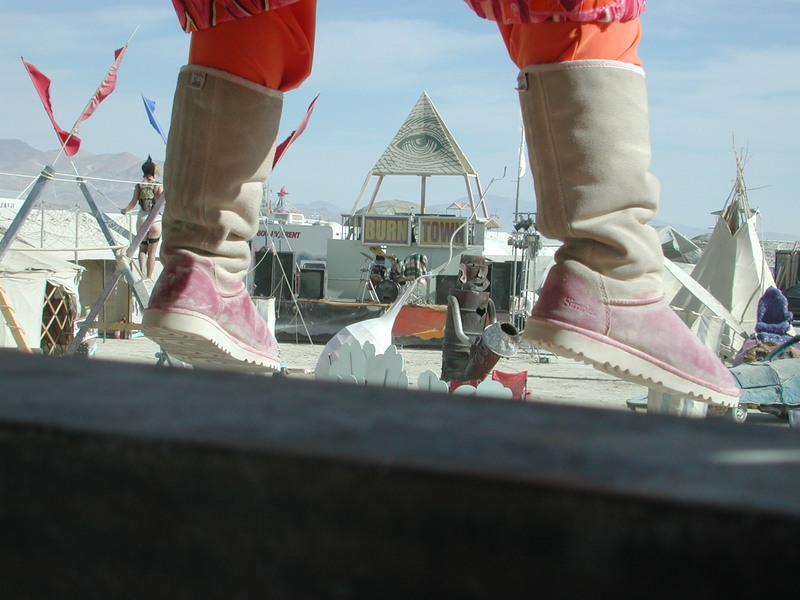 Pretending to be invisible in the default world means you believe in Burning Man’s 10 principles only once a year rather than as part of your everyday life. So drop the skepticism and become in your daily life what you are in your playa life — a participant.